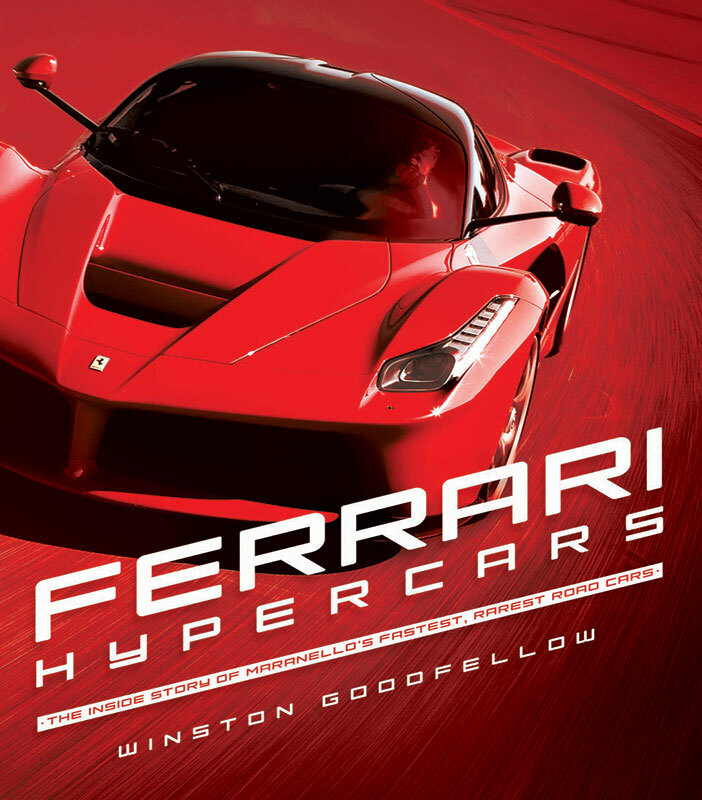 "Ferrari Hypercars" will be out in October, and may very well be my best book to date. LaFerrari is on the cover, and is the latest (and very impressive) chapter in a decades-long story about the quest for ultimate speed. For the past year I’ve been quietly slaving away on a Ferrari book with an historical storyline that has never been covered—an in-depth look that focuses solely on Maranello’s fastest ever road cars. These are those rare, limited production and one-off machines that when they were new, their performance was so high you didn’t worry about losing, regardless of who pulled up next to you. I then rattled through a number of other pre-288 models (6025 GT, a one-off 250 LM from 1965, the two 365 Ps from 1966, and so on), then said, “If you are going to go back that far, you should divide the book into three sections, done in one of two ways. The first is by the term the cars were called when they were new: exotics/super exotics, supercars, and now, hypercars. There was momentary silence on the line before Zack hit me with a question I suspected was coming: Would I do the book? I politely declined, saying I wanted to stay focused on the novel. After a couple more unsuccessful attempts at trying to change my mind, he asked if I would do the photography. That was an easy yes, for shooting is always faster than writing. Once the photography is in the can and you have edited it, you’re done. And we left the conversation there. Then I began thinking about the cars needed for the first section, for whoever was going to write the text would really need to know their stuff to get that section right. Just to make sure it was done properly, I decided to determine what those cars were, and potentially co-author the book by doing just the first section. After several intense days of research, and bouncing the results off people in Italy involved in Ferrari’s history, the list was complete. Which make me think, well, if I’ve done this much, why don’t I just outline the rest of the book. Upon completing that, and staring out the entire outline for two or three days, I literally thought Crap, if I’ve done this much I might as well write the entire thing. Zack Miller was a very happy camper when he got that call! Then the fun began, for now the book had to be written with a relatively tight deadline, and more very late nights than I care to remember. I’ve been so fortunate to interview so many people from Ferrari’s storied history, and shoot and drive a lot of stuff, but here was a very specific subject matter. From looking over my interviews there were holes that needed filling. Plus stuff had to be shot, so a trip to Italy helped fill some gaps. Then, when it came time to do pagination (the graphic design and layout of the book), Zack surprised me by asking me to choose every photo, and then put them in order. Which turned out to be an unanticipated godsend, for it totally transformed the book. Rather than relying solely on my photos, I went after the best of the best archival material, and contacted archives around the world. I wanted as much “romance” in the historic images as possible, so rather than just seeing a car back in the day, you would get a sense of the era in which it was made. Factory photos were also important, for now you could see how Ferrari grew over the decades, and how its technology and production methods changed. Plus there had to be photos of key individuals, for so often in books you read a name and have no clue as to what the person looked like. Some of the art used is my portrait photography, and a number are period photos. The text is primary information source driven, meaning a great portion of it is the men who made the cars are telling the story, and why they did what they did when they did it. There is also the big picture, macro-economic and social/political climate that I find so fascinating, for these elements definitely influence how cars are designed, engineered and constructed. The end result may well be the best book I’ve ever done, and I will leave it up to you readers to determine that! A number of the photos have never been published before, and a favorite photographic element is the use of key historic images to show exactly what was going on. For instance, on the latter, when we hear Sergio Pininfarina talk of pushing on Enzo Ferrari to do a mid-engine street car, and his envy when he saw the Lamborghini P400 chassis with its sidewinder V12 engine at Turin in 1965, there is a photo of the chassis at the show. Archives including Michael Dregni, John Lamm, Sptizley-Zagari, Revs Institute, Giorgio Nada and LAT came through with factory and other photos when I didn’t have them. And the custom coachwork era is properly represented, where every body style on the 375 MM and even weirdness like Scaglietti’s one-off 410 Sport (chassis 0594) is represented. Plus there are numerous stories in the text, of which a number have never been in print. Sergio Pininfarina had some wonderful anecdotes on being put through the ringer by Enzo Ferrari shortly after they began working together in 1952. Designer Aldo Brovarone told me about creating the sensational 365 Ps, and why they had central steering. Lorenzo Ramaciotti went over the difficulties of designing and engineering the F50 and Enzo, and what makes Luca Montezemolo such a brilliant (and demanding) leader. The book will be out in October, and it is an absolute piece of art to look at. The layout is brilliant, an adventure with every turn of the page for you never know what is coming next. Should you want an autographed copy, drop me a line here. I think you will really enjoy the read, and will (hopefully!) be quite entertained while learning something new along the way. Copyright © 2019 · Scott Grundfor Co. All rights reserved.